When i control alt delete there is no longer a option for me to open the task manager, i've also just had to get rid of some cookingluck adware. I have followed the steps in the cleaning guide which has got rid of my cookingluck pop ups but still have the task manager problems. Any help will be greatly appreciated. Also just noticed when i go to use the cd rom, it just spins up like crazy and wont stop even if i eject it, only way to stop it is to shut down. O4 - HKLM\..\Run: [SunJavaUpdateSched] "C:\Program Files (x86)\Java\jre1.6.0\bin\jusched.exe"
Edited by daniel393, 26 March 2008 - 02:28 AM. 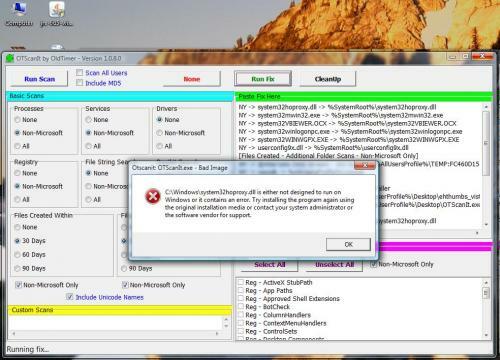 One or more of the identified infections is a backdoor Trojan and a key logger. Hi, thanks heaps for your help, it really is appreciated. when i used the moveit program alot of the files had a error message pop up and i forgot to save the results, so i ran it again and all the results have cannot be found next to it (see copied results) so i assume it worked. the combo fix didnt seam to do anyhting, after going though the prompts it said searching for infected files then just seamed to close itself, without producing a report when it shut. Anyway here is the reults from the second time i ran move it, and a new hijack this report. File/Folder C:\Windows\[email protected]@@k.dll not found. File/Folder C:\Program Files (x86)\Inet Delivery not found. File/Folder C:\Program Files (x86)\akl not found. File/Folder C:\Users\All Users\sbmxghir not found. File/Folder C:\Program Files (x86)\tmp3.exe not found. File/Folder C:\Program Files (x86)\tmp2.exe not found. File/Folder C:\Program Files (x86)\tmp1.exe not found. C:\Program Files (x86)\instaler.exe moved successfully. C:\Program Files (x86)\tmp0.exe moved successfully. I have also noticed that i still have no task manager so i'm assuming o'm not yet clean. Download OTScanit to your Desktop and double-click on it to extract the files. It will create a folder named OTScanIt on your desktop. I notice you still have some Norton on there - do you use their firewall or is it the leftovers from the anti-virus ? 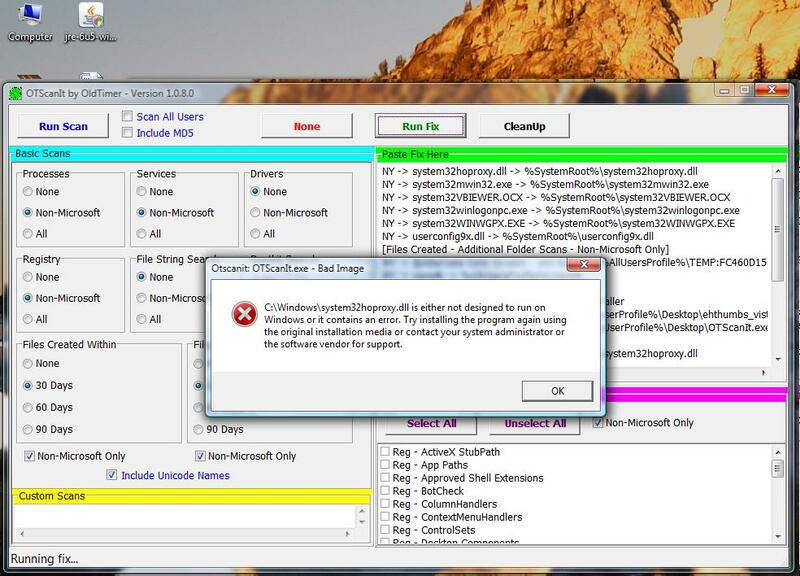 Ok had some dramas with that otscan again, ive attached a image of the error msg that popped up when i tried to use it, the same msg popped up for about 4 files then the program just stopped responding and i had to shut it, everything appeared to go well with the mbam program. I'm starting to think that if its going to be a massive mission to get rid of this i might just re format, the computer is only 3 weeks old so i havnt got much to loose that i havnt already backed up.